Ethereum's Constantinople Fork will most likely take place in late February. Mattie will walk you through Tron's latest moves as well as the upcoming Bittorrent token sale. This is a daily segment! Previous Post:MAJOR INVESTOR SAYS BITCOIN ADOPTION IS A BIG DEAL! You Should Hear Why! What u thinking about the recent apollo coin run going on? 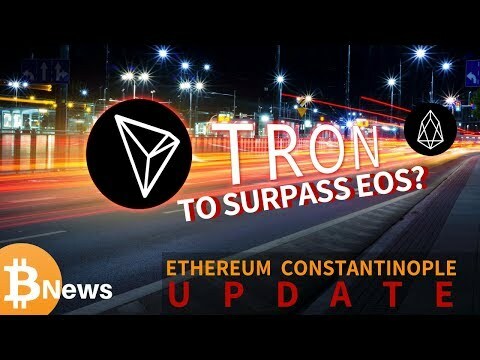 The question is not if tron will surepasd eos, the question is who will sign the right parthnerships. Bothe are quite same profile. Tron has has 100b circulation, eos 1b. At this early stages of the market were the future us unknown, lower circulatiin is an advantage. What do you think ? ROBETCOIN will defiantly be the biggest riser on 2019, when the live betting platform will go up, if you want to find the next great coin in crypto and you love betting explore them! So underrated right now, only 800k in the circulating supply. 100b or 1b coins, it doesn’t matter as you can fracture a coin into many smaller pieces. Justin Sun and Tron always seems to be comparing itself to another company. He needs to stay in his lane and just release a superior product. I’m not trying to shill for Apollo. I have made a small investment in Apollo, and I have to say I’m very impressed with their ability to meet the roadmap timelines, and this coins transaction speed.